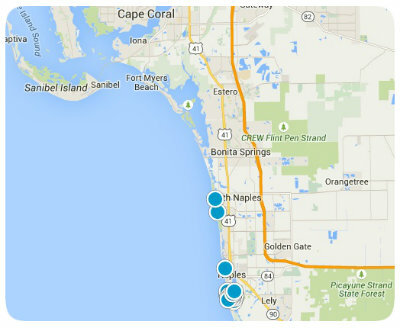 In North Naples Florida, off of Immokalee Road just west of I-75, is the thriving community known as The Strand. This 500 acre community is a home buyer’s dream, whether looking for a primary residence or a Florida vacation home. This exclusive gated golf community boasts all you would expect from a luxurious Naples lifestyle. Choose from a gorgeous single-family home, an opulent multi-family coach home or a luxurious villa. All the homes in The Strand give breathtaking views of sparkling lakes or lush green landscaping so you cannot make a bad choice. Life in The Strand is complete with a 27-hole champion golf course designed by Gordon Lewis, a 9,500 square foot tennis and fitness center, exquisite dining in the award-winning Country Club of 55,000 square feet and the opportunity to purchase multiple memberships. Residents can also enjoy The Stand’s full basketball court, putting green, “Aqua” practice range and a junior Olympic swimming pool. In addition to access to amazing schools, The Strand is in close proximity to a multitude of Florida’s soft sanded Gulf coast beaches. All of the exquisite amenities that Naples provides is just minutes away. Enjoy the world-class fine dining, upscale shopping at Mercato, and endless art and cultural attractions and opportunities for entertainment. With all that The Strand has to offer its residents, if you are looking to buy real estate in the Naples area of southwest Florida you should definitely consider buying a home in The Strand. If you would like more information regarding buying a home in The Strand, or you have other real estate questions, please do not hesitate to contact us today.